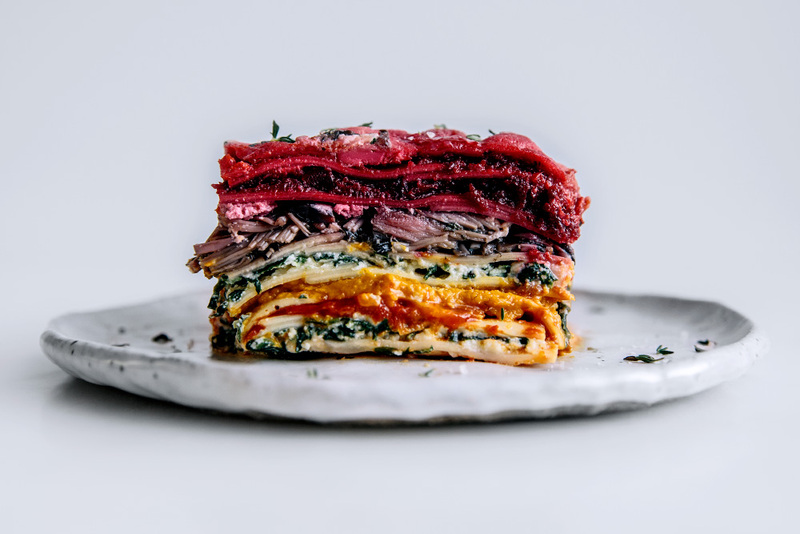 This week’s new recipe is a delicious veggie-packed rainbow coloured lasagna! I’m SUPER happy with how this one turned out. It’s definitely a winner but does take a little time to prepare as all the vegetables need to sit on separate layers between the lasagne sheets, creating that pretty looking rainbow effect. Baking and then puréeing the pumpkin and beets is also time-consuming. If you’re short on time, instead of puréeing the beets and pumpkin you could thinly slice them, bake them in the oven, and then add them as cooked slices in the lasagne. You could also roughly chop or mash them with a fork. The texture of the smooth pumpkin and blended beets tastes delicious, so if you do have the time, my first preference would be to purée them. Feel free to use any brown, flat or portabello mushrooms that you can find. I have used a mix of mushrooms (as you can see in the photos), mainly for their aesthetic and availability on the day I was shopping (how cute are they!). This recipe makes quite a large lasagne perfect for a family dinner or gathering, but you could also freeze the lasagna into portions for easy lunches and dinners during the week. Place the pumpkin on a paper lined baking tray with the garlic, sea salt, nutmeg, chili, and a little drizzle of olive oil. Bake in the oven at 190–200 degrees celsius for about 35 minutes. Blend the pumpkin and the peanut butter in a food processor until smooth. Place the beetroot on a paper lined baking tray with the garlic, sea salt, thyme leaves and a little drizzle of olive oil. Blend the beets in a food processor until almost smooth. Transfer the beets to a bowl and add the goats cheese. In a medium saucepan sauté the onion, garlic, and chili flakes with a little olive oil until soft. Add the passata, thyme leaves, bay leaves, sea salt, and hot water and simmer for 15-20 minutes. Sauté the spinach in a large pan with the chili flakes, sea salt, and a small drizzle of olive oil. Remove the spinach from the heat and allow to cool (for even pieces of spinach I like to use kitchen scissors to snip the spinach up a little, but not a necessary step). Stir through the ricotta and parmesan and set aside. Sauté the mushrooms, thyme, and sea salt in a large pan with a little olive oil until soft and brown. Partially cook the lasagne sheets in a large pot of boiling water for 3-4 minutes. Remove from the water and drizzle with a little oil. Now get ready to assemble (you will need to move quickly to ensure the lasagne sheets don’t stick). We are simply going to layer these delicious fillings. Grab a deep and large lasagne dish and add a couple of big spoonfuls of the tomato mix to the bottom. Then add a layer of lasagne sheets. Next, use half of the spinach and ricotta mix and make another layer. Then add another layer of lasagne sheets. Add the rest of the tomato mix to make a layer, then add another layer of lasagne sheets. Add the pumpkin mix and smooth over to make a new layer, then add another layer of lasagne sheets. Add the remaining spinach and ricotta mix, then add a layer of lasagne sheets. Add the mushroom mix, add a layer of lasagne sheets. Add ¾ of the beet mix, then (you guessed it) add the top layer of lasagne sheets. Add the remaining beet mix to the top layer of lasagne sheets and smooth over. Top with torn mozzarella, grated parmesan, thyme leaves and sea salt. Pour a little hot water into each corner of the dish (this helps to keep the moisture in the lasagne). Bake at 180 degrees celsius for 35-40 minutes. Enjoy! I love making sweet treats for family and friends at Christmas time! I posted an image of these waffles on Instagram a little while ago, and now many people have been asking me for the recipe. This isn't your typical classic apple tarte tatin. I’ve given the recipe a little healthy ‘Gather & Feast’ makeover.